Arcade Flashback: Galaga Remix's ‘original’ mode lets you play the original game in its 1981 glory. If ’80s-era coin-op arcade games aren't your thing, Galaga was the sequel to Galaxian—a next-generation Space Invaders, if you will. The screen swarms with waves of insectoid alien spacecraft you must shoot down with your space fighter. Galaga built upon its predecessor by introducing more colorful aliens that flew about the screen in eye-catching (and dangerous) patterns, along with bonus waves and a "dual-fighter" power-up that let you rescue fighters captured by alien motherships, to double your firepower. Pricey at $6—though there’s also a free lite version—Galaga Remix does poor justice to the series’ pater familias by displaying it vertically on the iPhone screen, leaving players little room to maneuver their ships or their button fingers. The remixed levels, however, use a more intuitive side layout; one thumb controls left and right arrows while the other shoots. Alternative control types, which use the accelerometer or a slider, are available for both modes, though the former feels imprecise and the latter blocks the screen. No good—except for the attacking alien vessels. Everything Old Is New Again: The new Remix version offers a more authentic iPhone gaming experience. 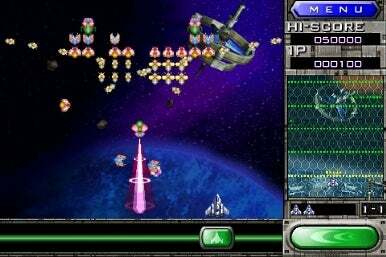 Galaga Remix’s enjoyably nostalgic soundtrack and the upgraded visuals in its newer mode, including a shiny metal ship and a number of interplanetary backgrounds, bring the game into the twenty-first century, making it appropriately sleek and playable for the iPhone. There, players advance through a tree of challenges, working their way to freshly-added bosses, with the ability to stop and continue at will—making this remix good for honing skills or just a quick play. 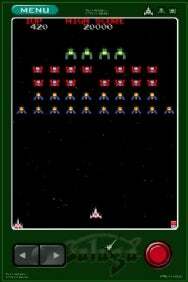 Galaga Remix is compatible with any iPhone or iPod touch running the iPhone 2.2.1 software update.